I always love something from the past especially vintage crockery and I don't go looking for them consciously now as my overstacked cupboard is now filled to the brim. However, my flea market vendor friends seem to look out for me when they find something special and then I go weak. Can't resist these Johnson Brothers Indies Blue Fine China dessert plates. They were produced in England and were probably released in the 80s. I am such a cheese novice. I don't really know much beyond Kraft cheddar cheese which my children love to grate over their spaghetti. I tasted sashimi as a kid and pushed it away like a spoilt brat but now, sashimi is one of my favourite foods. As for cheese, it is a growing acquired taste. After lots of sampling in Spain and even locally, I am beginning to like it. 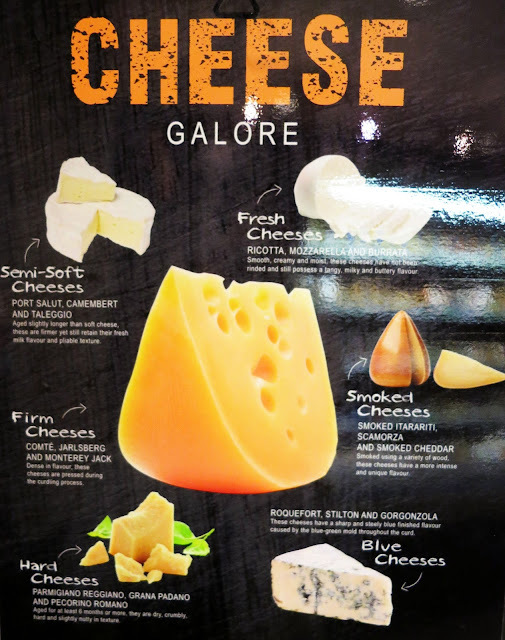 Saw this cheese chart in Jason's Gourmet Market and it kind of summarises the different kinds of cheeses out there. Picture is not as clear as I like it to be, so I've rewritten it. Smooth, creamy and moist, these cheese have not been rinded and still possess a tangy, milky and buttery flavour. Aged slightly longer than soft cheese. These are firmer yet retain their fresh milk flavour and pliable texture. Smoked using a variety of wood. These cheeses have a more intense and unique flavour. Savour 2013 took place over 4 days from 11-15 April at the F1 Pit Stop Building. Touted as Singapore's largest gourmet event, there was certainly more going on compared to last year, with more participating chefs, restaurants and Nespresso coffee ! As Nespresso was launching a new series of Italian coffee capsules, there were hip little Vespas on display, lining up the walkway leading to the Nespresso boutique. It was so hot that day that I parked myself at one of the air-con tents just to take a little breather while my friends went scouting for food at the Gourmet village. Some of my favourites include the short rib beef by Douglas Tay of Osia and cold angel hair pasta flavoured with truffle and Oscietra Caviar by Gunther ( slurped it up and forgot to take a picture). Most of the portions were pretty small but I came with the expectation of not having a hearty meal, just to taste sample size dishes of the most unusual flavours, some rather disappointing (there was an appetiser that was overpowered by sea salt) and some delightful ! It was also fun to watch a number of fangirls taking picture with their favourite chefs ! Then it was time to walk around the Gourmet markets. 2 levels - One level consisting of Savour lifestyle, Savour Gourmet and Jason's and another consisting of Savour Wine and Baking. I went looking for my favourite WindowSills pies especially the pecan pie before venturing beyond. A pleasant outing with my friends as we went around food tasting as well as learning from the people behind the brands. But honestly, we were still hungry and headed to the nearest hawker centre for our hearty food ! It was around 10 plus that night when I tasted a most wonderful beef noodle soup. Think the stock came from the bottom of the pot and wow, was it tasty! I like to savour exotic food but for me nothing comes close to heritage, comfort food ! Pink guava does make a good sorbet and the apricot paper was a nice touch which was fun to eat ! My favourite dish by far at Savour. A short rib, long on flavours. The beef melts in the mouth and the charred radicchio - delicious. If all my vegetables were cooked this way, I will finish it gladly. Peru - that is far, far away. Glad there 's a Peruvian who came all the way with this wonderful dish. Fresh and delightful ! Was at Carpenter and Cook for tea last week. I've not been in the Beauty World area for years and this area looks a little messy with the MRT construction going on but guess it will be a lot more accessible after all is done. Ordered a passion fruit meringue tart which looked like a little Alpine forest in spring with the snow melting away. The curd below the peaks tasted good as the sharp taste of passion fruit always goes well with sugar sweetness and the richness of butter.Was surprised that the brew of mint tea I had was made from fresh mint leaves. That's a nice touch as most places serve mint tea from tea bags. 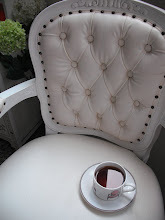 Ahh...blending passion for cakes and pastries with flea marketing, how cool is that ! Are you hungry, thirsty or both ? Is that Tweety Dee or Tweety Dum ? I do not love any particular brand in general and branded bags are way too overpriced for me to make sense of it. In fact, I have an aversion to bags with monograms and big metallic engraved brand plates. So it is quite out of my style to write about a branded product but I must admit that the Radley brand has grown on me over the years, since my first Radley leather cross body pocket bag. It was purchased at Heathrow airport years back and I have never even heard of the brand at that time. I was drawn by its simplicity and functionality and how it could be strapped across the body leaving your hands free for work or for play. You can also carry it in such a way that the bag hangs in front of the body which hopefully keeps the pick pockets at bay. Think my first Radley bag costs me 72 pounds which was quite a lot, considering the exchange rate then was 1 British pound to around 3 Singapore dollars. Over the years, the Singapore dollar has grown in strength while the pound has become weaker, making the Radley bag more affordable. Radley is not available in any shop in Singapore but there is a Radley Asian portal that sells it in Thailand, Malaysia and Singapore. Though it carries only a limited range, my interest has been rekindled again. Bought a Grosvenor cross body bag, a style inspired by an equestrian saddle and a Baker street grab bag inspired by a doctor's bag. It looked truly like my old vintage doctor's bag which I keep as part of my retro collection. 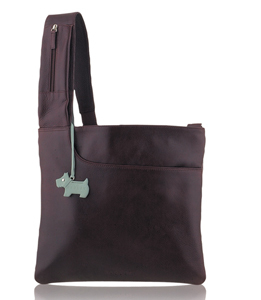 The Radley version of it is beautifully crafted in leather with a small and cute Radley terrier tag attached. Apparently, some Radley designs such as the pocket bag are their best selling classics which get updated seasonally with different colours, stitch details and texture. My first black Radley across body bag still serves me well after more than 5 years. 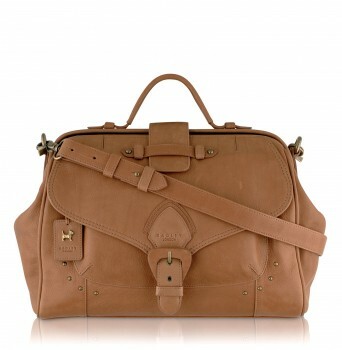 Radley bags are not high end glamour bags but well made leather goods - simple yet stylish, priced at the mid range market. Very niche among Singaporeans who often go gaga over Miu Miu, Prada, LV, Gucci and more.